It’s been over a month since us Aussies visited and commenced the border crawl 12 day mega ride. First of all I must thank you guys for putting together such a great ride. It was truly the ride you promised. You ticked all the boxes of what we asked for in our original email, to ‘experience the culture, rugged terrain, landscape and scenery of Vietnam’. I’m even impressed on how you managed to arrange the weather to fit into that experience. All the guys are still talking about it over here. The good thing is, all the talk is positive. So far everyone I’ve spoken to are now talking about doing a trip themselves. I only hope they are not just talking and they do do it. We all did survive the 42 recorded crashes for the 12 days. Now that we have had a chance to look back over some of the photos, we saw that Michael in fact rode off the edge of the track at lest twice, I think he kept that to himself. Therefore I think the tally might be a little higher then recorded. I can also say that we all have a new respect for the little 125 scooters the locals ride. But most of all, those Minsk are a fantastic bike to do that ride. They made it what it was, an awesome ride. There must also be a big thanks go’s out to the mechanic. He always had a smile on his face, and we know why, and he kept the poor little Minsk plodding along. He also managed to have the right amount of bread rolls everyday for lunch. He is a great member of your team and fitted in with us all on the trip. I’m sure some of the translation between you and him may not have been what was actually translated to us at the time. 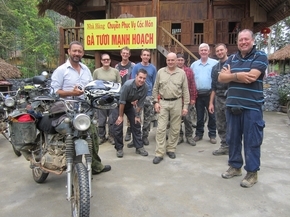 That’s a big thumps up to Explore Indochina team and yourself. I’ve attached a couple of photos I thought you may enjoy. The pink nighty lives on. We, I, had a fantastic time and it can only thank you for that. Thank you. I will recommend you and your team to everyone thinking of making a bike trip.